A bacon wrapped pork roast. 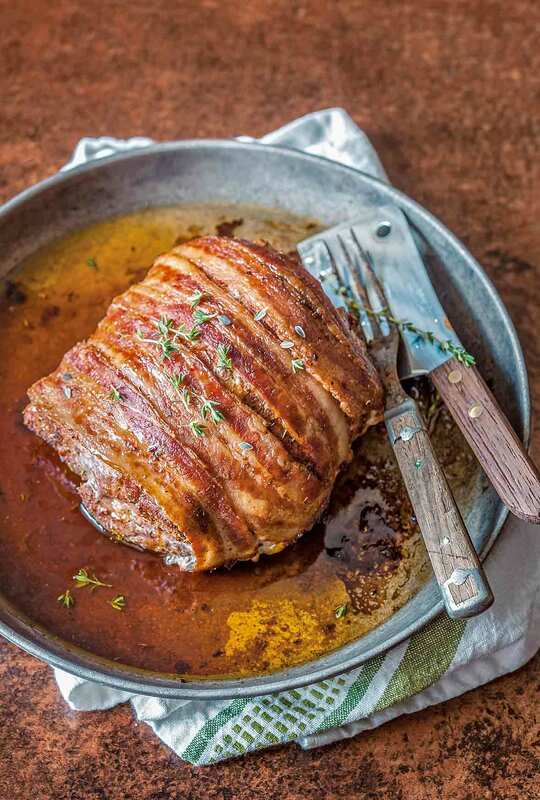 A boneless pork rib roast or tenderloin is rubbed with paprika, cayenne, garlic, and thyme, wrapped in bacon, and cooked to tender, moist perfection. What else can we say except make it? Now. 2. In a small bowl combine all the spices and mix well. Rub the spice mixture all over the pork roast. 3. Slick a rimmed baking sheet with oil, or line with aluminum foil. Place the pork roast on the baking sheet and wrap it with bacon. Transfer to the oven and roast until the internal temperature reaches 145 to 150°F (60 to 70°C); 50 to 60 minutes for a pork rib roast or 30 to 35 minutes for a pork tenderloin. Cover loosely with foil and rest for 10 minutes before slicing, oohing, and aahing. I was pleasantly surprised with the outcome of this bacon wrapped pork roast. It was very tender, juicy and did have a more robust flavor than my usual favorite. We all loved the spice rub, and of course, the bacon! And, did I mention the house smelled wonderful while it was roasting? A definite keeper! Prep work was super easy. It took all of 10 minutes to get the roast ready and into the oven. I served the roast pork with individual potato Gruyere gratins and sautéed shallot and green beans. This was so simple to put together that I actually made it while camping using a trailer oven. I loved how easily it came together and my whole family loved the flavor of the spicy pork, including my 10 year old. Of course, anything wrapped in bacon is pretty much guaranteed to win over my family. Definitely easy enough to put together on a weeknight but nice enough for company. We used a pork roast and found it was perfectly cooked in just under an hour. Super easy and flavorful bacon wrapped pork roast, this takes under an hour for a moist and tender result that looks like more work that it really is. The spice mixture is all from pantry staples, and the bacon wrap provides a nice finishing touch. I really liked the spiced coating sealed in with the bacon even more than my usual crusted herbs or seeds or even a wet sauce of mustard or a hot sauce. If you use a tenderloin as we did, you will probably find the bacon slightly less crisp than a rib roast since you’re only going to need 35 minutes in the oven, but the bacon is thoroughly cooked and slices nicely with the pork. Easy for a weeknight, but special to serve on a weekend or to guests. We served this with sweet potato tots, and a beet and tomato salad. This bacon-wrapped pork roast dinner main was easy and flavorful. I used a pork tenderloin, which made the recipe come together quickly enough for a weeknight meal. I used thinly sliced applewood smoked bacon. The tenderloin required 5 pieces of bacon to fully cover it. I would try setting the roast on a rack the next time I make this, so that the bacon would have a better consistency all the way around the roast. I served it with asparagus and a 7-grain side dish. 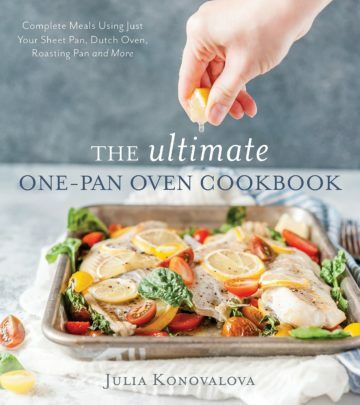 Bacon Wrapped Pork Roast Recipe © 2018 Julia Konovalova. Photo © 2018 Julia Konovalova. All rights reserved. All recipes and photos used with permission of the publisher.